Dr Tashi Samdrup, Director General, Department of Livestock, Ministry of Agriculture and Forest, Royal Government of Bhutan receiving the oat grass seeds from Dr Nakul Chettri and Mr Karma Phuntsho from ICIMOD. Animal husbandry is an integral part of farming systems in the Himalaya. Livestock provide dairy products, meat, draft power and farmyard manure. High altitude meadows characterized as rangelands have been traditionally used by both wild and domestic herbivores and they are an important source of livelihood for highland herder communities. High altitude pastures are used mainly for summer grazing only as the harsh cold weather makes habitation impossible in winter. As grazing area is limited and the growth rate of high altitude plants are slow, the availability of fodder and nutrition in high rangeland areas is one of the major challenges faced by highland herders as well as wild animals. The Kangchenjunga Landscape Conservation and Development Initiative (KLCDI) is a transboundary initiative which covers an area of 25,085.8 square kilometres, and spreads from the Terai-Duar lowlands of India and Nepal across the midhills of western Bhutan, north-eastern India and eastern Nepal, to the high Himalaya of India and Nepal. Contributing to the integral farming system of the region, rangelands occupy 19.7% of the total area of the landscape. 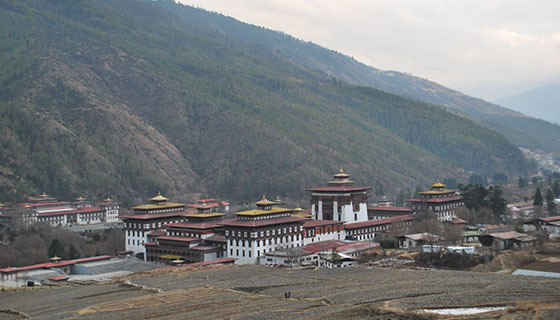 Thimphu Dzong and the Thimphu valley where the Ministry of Agriculture and Forest, Royal Government of Bhutan. Rangelands are a source of fodder for both domesticated and wild animals. Dependency on these rangelands is particularly high in some parts of the landscape, especially in Bhutan and Nepal. Herders are facing fodder crises, especially during winter, due to harsh weather and slow growth. There are incidents of mass livestock death due to sudden heavy snow fall and fodder crisis. Such losses are unbearable to herders struggling with poverty. Even as the culture of herding is dwindling in the eastern Himalaya, mainly due to the associated hardship and lack of interest from the young, there is a desperate need to revive it to keep rangelands healthy and sustain the livelihood of high mountain communities. With support from the International Centre for Integrated Mountain University (ICIMOD), Bhutan could avail a high quality and productive variety of oat grass (Table 1) from Lanzhou University, People’s Republic of China. This oat grass is among the best in terms of productivity and nutrient content, and has the potential to address fodder shortages in Bhutan and elsewhere. Table 1: Oat grass from Lanzhou University (Courtesy of Professor Zhao Guiqin). 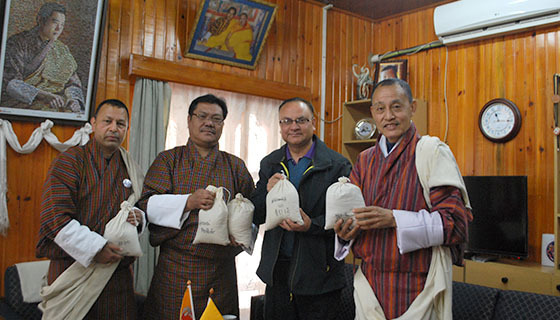 The seeds collected from Lanzhou was handover to Tashi Samdrup, Director General, Department of Livestock, Ministry of Agriculture and Forest, Royal Government of Bhutan. While accepting the seeds provisioned for the experimental trail, Samdrup appreciated the facilitation and support provided by ICIMOD. “The department takes this as a very positive move towards managing fodder shortage faced by herders. Fodder will be a crucial component of our Highland Development Programme, which has received the status of a Flagship Programme in our 12th Five Year Plan (2018-2023),” he said. Samdrup expressed his gratitude to Zhao Guiqin, Lanzhou University, Ruijun Long and Yi Shaoliang from ICIMOD for their support. “Such initiative on the exchange of knowledge, best practices and technology is important for vast swathes of rangeland ecosystems which are transboundary in nature,” said Nakul Chettri, Coordinator of KLCDI at ICIMOD.